Where is the ideal place to enjoy the company of Ping, Pang and Pong? Sicily, I think. You will know, gentle reader, that I refer to the three bureaucrats at the court of the Emperor of China, who play so large a part in Puccini’s opera, Turandot. The production I have just attended in Palermo was visually and musically wonderful. In an opera house which is itself an exquisite work of art – the Teatro Massimo – I spent three hours which were truly life enhancing. And all this came after an afternoon in which I had gazed in wonder at the shimmering gold and austere figures of some of the noblest Christian artefacts in the world – the 12th century mosaics which fill the cathedral of Monreale, on a hill overlooking Palermo Bay. Humming Nessum dorma, for ten minutes I sauntered back through the evening streets of central Palermo to the Grand Hotel et Des Palmes, and thought that life was a privilege. 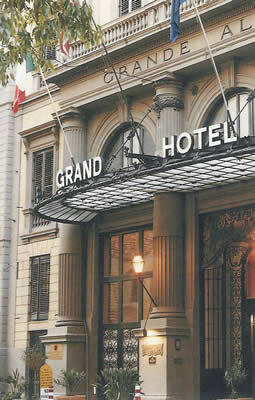 The Grand Hotel et Des Palmes is itself a fine pile. 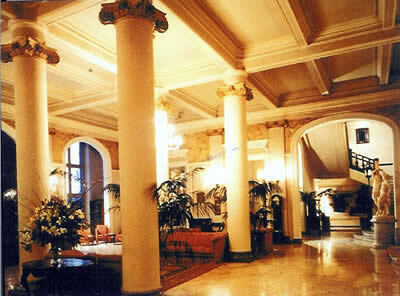 Opened as an hotel in 1874, it has the space and classical style one expects of the period. Columns, sweeping staircases, long vistas and life-size statues (copies of works by Canova) create an atmosphere of restrained grandeur. As soon as I arrived, I felt that this would be a comfortable billet. Its entrance hall was made to impress, and I was impressed. There are pleasing touches of lightness in this space, too – from the Art Nouveau plasterwork and stained glass, introduced by the famous architect, Basile, in 1907. One piece of advice you must take to heart, however. Palermo is a place of busy traffic and demonstrative drivers. You will need to ensure that your room is not on the front of the hotel. Instead – like mine – it should face into the central well. Thus peace and quiet will be assured. Room 339 was on the third floor. It was possessed of a proper hallway, a tiled bathroom of good size and a spacious bedroom with yellow walls, red carpeting and a pair of pink wing chairs. Behind their three mirrored doors, the fitted wardrobes offered plenty of hanging space. The beds were comfortable and their crisply laundered sheets were, of course, changed each day. Two table lamps, one standard lamp and a chandelier provided the illumination. This was accommodation of the traditional sort. It was also excellent value at 232 euros a night, bed and breakfast for two. Many of the rooms will soon be renovated and up-dated. For my night at the Opera, I had brought to Palermo – as a gentleman does – my dress suit, black tie, starched shirt, wing collar, et al. 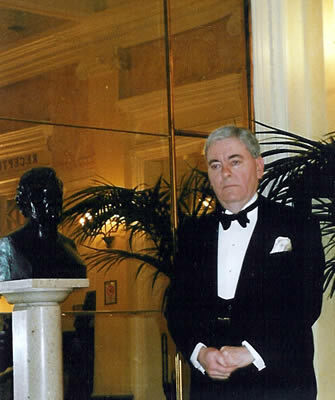 Thus attired, I wandered the corridors of the Grand Hotel et Des Palmes and felt entirely at home. Indeed, I paused by a fountain and a bust of Richard Wagner and allowed my photograph to be taken. (The resulting picture is reproduced herewith for your edification.) Mr Wagner stayed at the hotel while he was composing Parsifal. I hope he enjoyed his time here as much as your correspondent. The wine list is brief, with just 70 offerings – most of them Sicilian. Vintages are not given. Bottles range in price from 11 euros (Vigna, Cantine Rall) to 75 euros (Deliella Nero d’Avola, Cantine Principi di Butera). I can recommend, from my own drinking, two Sicilians of modest cost: a soft white of vanilla and lychees (Regaleali, Cantine Conte Tasca d’Almerita, 2004 – 16 euros) and an earthy red of ripe black fruit (Nero d’Avola, Cantine Conte Tasca d’Almerita, 2004 – 18 euros). 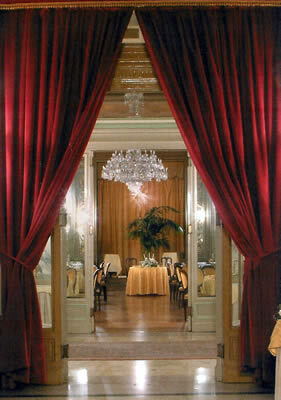 Breakfast is served in another grand room, the Salone Degli Specchi. Here, surrounded by more mirrors and crystal chandeliers, I set on my yellow tablecloth dishes from the central buffet – of which I recall with most pleasure the flavoursome bacon. This was a calm and leisurely way in which to break my fast – a moment to indulge in some quiet anticipation of the treats to come during the day. Indeed, that is how I now think of Palermo – as a place of treats. The mosaics of Monreale or the stirring harmonies of the opera at the Teatro Massimo – these world-class attractions call to every traveller who seeks delight for the eye and for the ear. The Grand Hotel et Des Palmes is waiting – with its welcome, its grand architecture, its convenient location and its attractive prices. And, who knows? You might even be able to enjoy the company of Ping, Pang and Pong. Via Roma 398, Palermo 90139, Sicily, Italy.